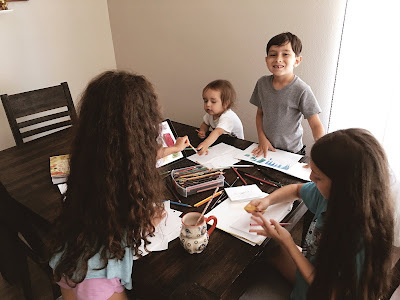 I recently learned that our educational style and philosophy is very much in line with Waldorf schools (how exciting to know that I'm not alone!). Seriously, when it comes to educating my kids, sometimes it's scary to feel so alone in my methodology (am I crazy for doing what I do?). In a nutshell, we aim to educate in the most natural methods possible--formal education is delayed. I wanted to share some of my favorite things. We do not use traditional curriculum in our home. My kids seem to have different preferences in the way they learn so I go with it. My eldest daughter LOVES reading and hated traditional math drills and worksheets. She is great at math, but every time we did math studies it resulted in boredom, frustration, tears, and eventually full-blown anxiety. It just didn't feel right or healthy to have this sort of response, especially from a 7 year old! Valene at 7 years old. I began to reduce math to 3 days a week and on those 3 days, she would wake up with stomach aches. Over time I began to omit math lessons in favor of real-life scenarios and working out real-life problems with her. She was clearly competent in the materials, but I was at a loss. After talking with some other homeschooling friends, I realized I was not alone. This was the same way that I remember feeling in elementary school. I did not want this for her. A friend suggested that we try Beast Academy books. They are read in comic book style. The books were really engaging for her, but I think the books that I purchased were too advanced for her age. While she did learn some things, it was still dependent on worksheets. I really wanted to move away from that. Without the worksheets, I had a difficult time figuring out how much she really understood. I think these are great for kids who like worksheets (my second-born does) but want a non-conventional approach. As I read reviews on Beast Academy, I stumbled upon the Life of Fred collection. I read sample pages and was sold! Spending a day at a local farm. Which is heavier, a baby or a pumpkin? The Life of Fred books are a non-consumable text book that reads like a chapter book. It follows a comical story about a child named Fred who is a university professor. While learning real life math applications, the reader also learns interesting historical facts, Latin roots/words, and other occasional foreign language words. At the end of each chapter are 1-4 questions regarding what was read. The questions vary in form but it doesn't feel like work. It isn't tedious. It's very self-paced and self-directed. Here we are two years later and still using these books (they go all the way to college age!). We do use a few manipulatives. Kids learn best when engaging in real life activities and when mimicking life. These learning cubes have been great for understanding carrying numbers. I love them. My 7 year old son loves building with them and because they do not have the restriction of just building up like Legos, he makes really amazing things with them! Each color comes in 10 for a total of 100 cubes. We recently ordered this Visual Math book. It really is amazing, but baby Paul got his hands on it and ripped a few parts (insert crying face). If you click on the link you can preview a few pages. My kids really enjoy the shape building inside as well as the fraction conversions! It's really a fun book! We got this at a homeschool curriculum fair with the teacher's manual and manipulatives (they are pop outs and look SOOOO messy). We don't use either of those items. She just works through the book. Math is really important--after all, it is the universal language! What a great post on the homeschool. Actually I have started the research on schools or collages education after visit on Typical Student, cause there has many interested post about kids education.